Commonly known as a pest to pet owners, the female flea can lay up to 50 eggs per day, about 2000 in her lifetime. She lays them on your cat or dog and they quickly fall off, lodging in carpets and furniture. So Why Do Fleas Become A Problem So Quickly? The eggs will hatch in between two and five days. The adults come out of their cocoons when they detect a “host” is nearby. They then hop onto a host, the adults mate and begin the lifecycle all over again. The entire lifecycle can be as short as 3 to 4 weeks. 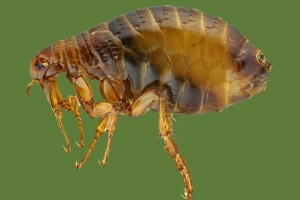 Once the weather starts to warm up, there will tend to be an increase in fleas within 5-6 weeks. Due to the nature of their breeding, commonly available pet flea powders often are not effective in ending the lifecycle but only kill active fleas, not the eggs.